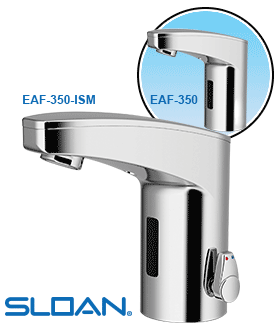 Sloan's new EAF-3XX series electronic hand washing faucets operate by means of a dual infrared sensor and microprocessor based logic. 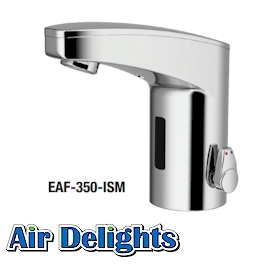 The modular design incorporates all the operating components of the faucet, including the sensor, solenoid, circuitry and battery above the sink deck within a die-cast metal spout. 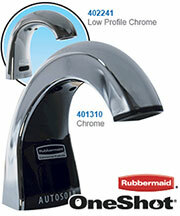 When the EAF faucet is installed on a sink that has three (3) hole punchings, a trim plate should be used. Trim plates must be specified and ordered separately. 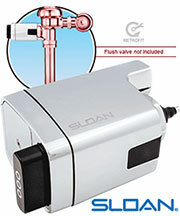 The IR-Click is a detector located in the sensor window of the faucet spout that allows the user to place the faucet into the following function modes: Continuous Run, Temporary Off and Auto Set Range Adjustment. Because the use of the IR-click feature requires familiarity with the faucet, this feature is not recommended for faucets intended for use by the general public. 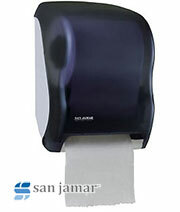 The IR-Click is ideal for use in hospital rooms, executive restrooms and other locations where the primary user has regular contact with the product. To use the IR-Click, cover bottom half of sensor with finger, wait 2 seconds for Green light, then remove finger. When in programming mode, each touch of IR-Click will produce a quick Green flash.